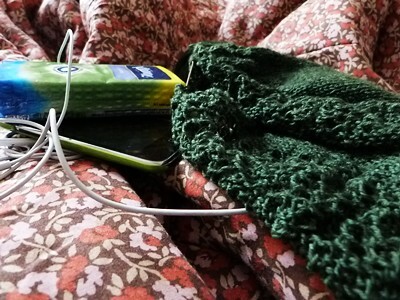 (Yes, that is a 1940s quilt/blanket) I am hiding under my quilt clutching tissues, listening to my iPod, occasionally working on my new pattern, but mainly just dozing as I am bravely battling the common cold. So, here are some things I have enjoyed recently. Fallen London - a nice little gothic Victoriana browser game. Critical Hit Podcast - A guy at my new RPG group recommended this and it is ace. Nyan Waits. Tom Waits meet Nyan Cat. I am so sorry. Wind Map. It is beautiful. Patrick Wolf - Lupercalia. Still.